Tsetang Trekking in Tibet, Tsetang Trekking. Welcome to Tibet -a land so rich in Culture, tradition and steeped in religion along the far flung unique landscape, also called the roof of the world. Let the age old Tibetan Myths & mysteries cast and enchanted spell that holds an every visitor in thrill and excitement. This tour offer you most of the popular sightseeing tour in Tibet including Potala Palace, Norbulinka Palace, Sera Monastery,Depung Monastery, Ganden Monastery, Gyantse, Jokhang Temple and Barkhor market, Sighatse and Tsedang. All the Old Monastery surrounding Tibet equally important. Here we have designed a tour. Day 01: Fly to Gongka airport and transfer to the Hotel (100KM.) Afternoon acclimatization. Day 02: Morning visit Yongbulakhong palace and Changdu monastery. Afternoon visit Tibet kings Tombs. Day 04: Morning- visit Kumbum and Pelkor chode Monastery at Gyantse. 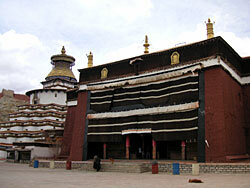 Afternoon- drive to Shigatse(100 KM) and visit Tashilhunpo monastery. Day 05: Drive from Shigatse to Lhasa (270 KM). Day 06: Morning- visit Potala Palace. Afternoon- visit Sera Monastery. Day 07: Morning visit Jokhang temple and Bakhor Street. Afternoon visit Drepung monastery. Day 08: Transfer to the airport (100 KM) and fly out.